There is a window in my little house that is marked with magic. It is the window that catches the most sun and the day’s warmth. Tucked away upstairs facing the west, the window has a living border of ladybugs. Our little ladybug boarders didn’t arrive until late last Fall while we were in the throes of our home renovation, so I took little notice of them. It wasn’t until after the dust cleared and I was busy setting the house into a more homier mode than something featured in Vagabond’s Digest that I realized our visitors were here to stay. During my first few weekly cleanings, I simply vacuumed up the little red dots. That area didn’t receive as much attention because there was so much else to be done. Then, the next week, they were still there, but more this time. It wasn’t long before I became frustrated over my inability to thwart these small creatures. They would flutter, flit, and behave as though they were on parade. The ladybugs’ constant motion brought to mind little motorized domes performing their moves in synchronization. Some were bright red and others were a red-orange. Some had spots while others had none. They even learned to “play dead” immediately upon hearing the vacuum cleaner start up. Now, when the ladybugs decide to freeze, I swear they create a suction to the window. It’s like trying to vacuum up a piece of half-melted hard candy a child will leave behind on the rug. I think that’s what they make super-glue from. Not to be outdone with my superior cerebral powers, the game began in earnest. Dishes would lay waiting in the sink and laundry would miss its rinse cycle while I was at the top of the stairs with my trusty vacuum cleaner. There was the trial and error stage as the machine was tripped on and off like a light switch, those insects reacted just like Pavlov’s dogs. They react quicker than any kid performing in their version of “One-Two-Three, Red Light.” Once the machine was shut down, they would scurry into the nearest crack where neither my vacuum crevice tool nor my fingernails could reach them. I did discover that if you brushed them away from the window with your hand without the accompaniment of the mighty suction machine, the lady bugs will calmly fly about, light upon a hand or an arm with amazing trust. It called to mind all the times I used to play with them as a child—outdoors. I just didn’t want them in the house, that’s not where they belonged. I pushed away the nasty vision of being a monster with a death machine. I continued to subject them to a swift, hopefully, painless end week after week. Yesterday was Saturday, my day allotted for weekly cleaning, and the day of death for many ladybugs. Erin followed me up the stairs to help me out which is unusual because she hates the sound of the vacuum cleaner. I don’t know why, because it always helped put her to sleep when she was a tiny tot at naptime. Now a ladybug’s life span isn’t very long, so the window seat is normally littered with the fellows that didn’t make it from last week, thus I started there. I was reluctant to start again on the window at the live lady bugs who either making a fast getaway or simply hoping to be invisible. Red is not a color of choice when hoping not to be seen, but they were game about it anyway. I took a deep breath and looked at Erin, who at seven can level a disapproving stare as well as any adult. It wasn’t disapproval I saw from her, but shock as she stayed my hand with her own. The upstairs is a great open play area which is Erin’s. Little did I know that she loved these little bugs as much as I had in my youth. She didn’t care that they were supposed to be outdoors and not inside the house. While I harbor no guilt about the trapping of mice that find their way into my country home because they do damage, I was suffering over the ladybug situation. Even though it had begun with an ardent desire to eradicate them from my home, I never could poison them with bug spray. Over the weeks I felt less and less of a murderous bend as my guilt feelings grew. I had already lost the battle and I knew it. Between Erin’s entreaties and the ladybugs proclivity to survive, the ladybugs had earned their place in the sun and in our home. And, while every home has it’s share of insect inhabitants, the ladybugs do no damage. What the ladybugs do provide are spots of sunshine as winter wanes. They buzz with life and fill other innocents with the wonder of nature. The ladybug’s dogged survival instinct must be applauded, especially when one woman with a wonder machine can’t make a dent in them. I am now happier too. Not only do we coexist with the dog, the cat, and the hermit crab, but we have a small colony of lady bugs to provide us a picture into another world we share daily with others but have little awareness of. So rather than feeling frustration over the invasion, we’ll enjoy our living kaleidoscope, as it should be. 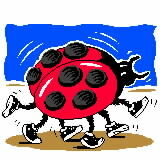 The dance of the ladybugs is a mysterious gift. They are home and here to stay.